I clearly remember my first impression of Anima’s Light of Aluna. I was in my car–I often load my CD changer and then forget who I put in there–and I heard throat singing. The sound got hold of me, as it tends to do, and my first response was, simply, “Cool…” As the sounds proceeded to broaden and open, they brought me into spaces reminiscent of my early excursions into the more electronic side of New Age, and then Light of Aluna had me pretty well hooked. Musician Ali Calderwood and vocalist Daniela Broder fill an hour with changing, always gentle soundscapes with a healing-music sensibility. Lightly energetic in spots, the album overall is quite laid back and spiritual. Tone and tempo shift just slightly as the music moves along, never enough to break the easy flow. Calderwood’s piano and guitar work mesh neatly with his electronics, from soft pads and swells to sparkling, classic-synth runs and arpeggios. When Broder’s voice glides in like clear river water, it adds a sacred-music feel and a true performer-to-listener intimacy. She is at her best on the absolutely gorgeous “Peace,” her chants and verses coursing intensely over deep drones and rising, glittering synth sounds. Her voice takes on a storyteller quality, and you’ll find yourself swept up in the narrative. Calderwood keeps his input on the low end, letting Broder spend the entire 10 minutes in the spotlight. 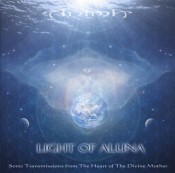 The more I listen to Light of Aluna–and believe me, I have listened to it quite a bit–the better it gets. There’s always some new element of beauty that reveals itself in the next listen. Calderwood’s compositions are nicely layered, smoothly flowing and absolutely soothing. It’s healing music without some of the overdone memes that can plague the style. This music makes its way into your spirit, soothing and salving, but never gets entangled in its genre’s trappings. It just does what Anima set out to do. A great repeat listen that should definitely be enjoyed in headphones. Expect this one to rank high on New Age and healing music “Best Of” lists at the end of the year. Available from the Anima web site.